Back in August 2003 I attended The Leeds Festival, the equivalent of The Reading Festival but held in northern England and easier to get tickets to. Unfortunately, the evening we were supposed to drive to York to stay with our friends before the festival began, I suffered an eye injury. Although the eye doctor had reluctantly agreed that I could attend the event, her conditions were that I shouldn’t drink or be physically active. Drinking and bouncing around are two of the numerous things that make music festivals fun, so although I put a brave face on things it wasn’t the experience I hoped for. The next day followed a similar pattern with a long wait for the headliners, Linkin Park. Then, as dusk approached, Placebo took to the stage and just absolutely blew me away. I didn’t have to be drunk or jump around to enjoy their performance. It was more than enough to lean back, fill my ears with the music and let it all soak in. As the sun set it was suggested we pretend it was daybreak instead, while the band played their anthem; Pure Morning. It was a feast for the senses and an absolutely magical moment that made me a fan for evermore. For whatever reason, I had not managed to see them live again since that night. And then, back in the summer, I received a notification that tickets for Placebo playing in the Usher Hall in Edinburgh would be on sale later that week. I spontaneously set a reminder and, when the time came, I managed to secure a couple near the centre of the upper tier. The actual date of the concert was a Saturday night in October – so far ahead at that point that when the tickets arrived I stuck them on the shelf and mostly forgot about it. I’d not been to a concert in Edinburgh before, never mind the Usher Hall. The reason being that it’s a pain to get back home from Glasgow after a gig, never mind Edinburgh, but to ensure I wouldn’t have to worry about that I booked an Air BnB room for both the Friday and Saturday nights so we could enjoy a bit of time in Edinburgh into the bargain. From the map, it looked like the flat we were staying in was close enough to the Usher Hall that we’d only have to brave a short dash to the venue should the weather be atrocious. Yet when we got there it turned out to be a brilliantly sunny and warm weekend and the perfect base of operations. Not only was the ‘Hall just 100 yards away from the flat, but the surrounding area was brimming with good bars and I found an intimate little tapas restaurant, where we ate on Friday evening. On Saturday we leisurely strolled along The Royal Mile during the afternoon, carrying our jackets and wearing our shades in the unexpectedly warm autumn sun. Once back on Lothian Road, about a five-minute walk from the flat, we burned the time before we had to get ready for the gig by drinking in a bar that had once been a cinema. Although proximity to the venue had been one of my main considerations in booking the room, I still couldn’t help but smile at the sheer convenience of walking out the front door, crossing the road about 50 yards away and boom! we were there. The queue snaked around the area outside the main doors, but as we had allocated seats we didn’t bother joining it and instead ordered a drink in very busy bar beside the hall. That finished, we simply strolled out a side entrance and up to the doors of The Usher Hall without standing in line at all. It felt almost like having a VIP pass. Once we’d climbed the stairs to the upper tier we bought expectedly expensive drinks and excitedly waited for the show to start. First up was a support band called The Husky Loops. We missed the start of their set, but they sounded pretty good and were quirky in a way befitting of the main act. The lead singer and guitarist sure knew his way around the – seemingly dozens of – effects pedals, put it that way! We hit the bar once more before Placebo came on and made it back to our seats in anticipation of things to come. Strangely there were a few empty seats around us and people took the opportunity to move to the left to be closer to the centre, but we just stayed put. Without much of a warning, the lights dimmed and the metronomic riff of Pure Morning rang out. A montage of images from Placebo’s 20 years of concerts flickered on the big screen behind them as each of the performers took the stage in turn. Once assembled they were into their signature track to send my spirits soaring as it had done all those years before. I was grinning ear to ear at the way the acoustics of The Usher Hall worked. I had wondered if the sheer scale of my previous experience might overshadow this more intimate venue, but if anything it was so much better. Every chord, every note, every refrain filled the space and my ears in turn. It was clear from that first song that Placebo are still in their prime and we were in for a treat. I’d listened to them a fair bit since I last saw them live but, even so, I was still taken by how many stand out songs they have in their repertoire. Without You I’m Nothing, a David Bowie tribute, was warmly received midway through the main set that left 36 Degrees, For What It’s Worth and Special K ’til late and reached a rousing crescendo with To The Bitter End. The crowd joined unanimously in a standing ovation as they left the stage and the band didn’t keep their audience waiting long before the first encore, which included fan favourites’ Teenage Angst and Nancy Boy. That done, yet more applause brought them back on for one last song and I immediately recognised the opening bars of Running Up That Hill, the revered Kate Bush number. 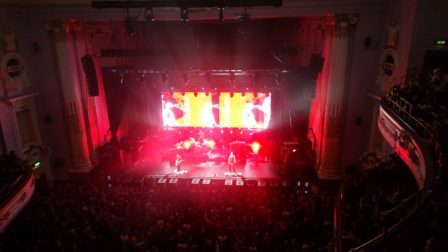 Placebo played their version to perfection, with a sustained outro as the band left the stage in turn in the reverse order of which they had arrived. While the hall emptied I could see smiles everywhere and I was struck by the wide span of ages. There were teenagers and oldies (even older than myself!) sporting happy faces from the experience as we spilt out into the warm evening air. It felt good to have been there to be a part of that energy. My first Placebo experience made me a fan. My second has made me even more appreciative of their incredible talent as artists. I hope I get to see them again sometime – hopefully without as long a wait.